Hi! 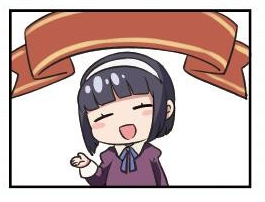 Mary here. Since everyone’s out sick I thought I’d do a little update today. What’s that? Shipgirls don’t get sick? Of course they don’t. I’m talking about the creators of the series, silly! We’re still pressing along even if it is flu season. In any case, now that our printers are back up, you will be able to find me in the latest U.S. Navy Food book. Hint hint. You should totally think about checking it out! …Yes, those are my eyebrows. Next question. Why am I not in a … bikini? You pervert it’s NOVEMBER! I’ll wear one if we ever get to that bit in Silent Service or if it’s summer, okay! Anyways. 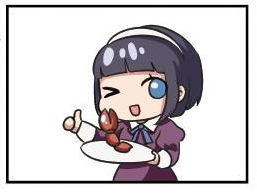 Since today is a food-themed update, I thought it would be a good idea to pick my favorite food: the crab! First things first. Why does Maryland have the best crabs in the entire country? There’s a lot of answers to that question. Some say it’s because we lost the Oyster War against the Virginians. Some say it was the unique culture of the time. Some say it was the abundance of blue crabs in the region right around the First and Second World War that resulted in the explosion of crab consumption. The simplest answer is that they’re delicious. But, since we are talking about history and all, there are a few things I think we should think about. The first is this idea that crabs are somehow a by-product of more valuable catches. This is factually inaccurate (though not incorrect). While it is true that fishermen tended to have targets that aren’t crabs (oysters and scallops in particular was a very lucrative trade!) small-scale fisheries of crab definitely existed and people were definitely eating crab well before it got popular around the 1930s and 1940s. The second idea is that somehow crabs were “poor people food.” I think it is tremendously dismissive of culinary traditions and create offensive stereotypes to suggest that certain common foods were consumed largely by members of specific classes. After all, almost everyone in America ate potatoes regularly and in some fashion throughout history. Are potatoes “poor people food” as well? Because what that sounds like to me is that you’re calling everyone who eat potatoes poor! Crabs did not command the extraordinarily high prices we see on the market today. However, few food items at the time did. Even good cuts of steak were not out of reach (unlike today) for the average American family. What is true is that you can trace our current “tradition” of the crab boil to a specific culinary tradition belonging to a specific people. The “watermen,” which are the crab catchers of the time, routinely boiled their crabs and seasoned them with things like salt and pepper for taste. Sure, the watermen were one of the poorest professions at the time, but they made an honest living, and even the rich who dined on Crab Imperial sought out crabs – be it in the form of stews, crunch, shell, cube, salad, cake, or the good old boil. 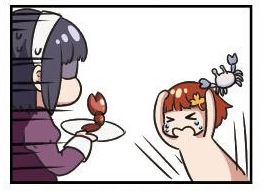 The third misconception is that crabs are novel food items. Again, as I mentioned up there, it isn’t. Plenty of old cookbooks popular on the coasts will tell housewives how to prepare crabs. This is strictly a matter of practicality because transportation was primitive and you were unlikely to have crab as a regular part of your access to seafood. What is novel, however, are a few inventions right around the time of World War II that made the crab tremendously popular. I’m going to count three. The first is the ready to eat spice packet. The most famous one in Maryland is India Girl Shrimp and Crab Seasoning. You know this thing better as Old Bay. The second is the almighty crab hammer. It made eating crabs a lot easier with a convenient way to crack open their shell. The third is the refrigerator, which made it possible for Marylanders to eat crab and for Maryland watermen to sell more of their crabs. refrigeration not only allowed for foods to be preserved for longer, but in the crab’s case, it allowed much greater options for fresh seafood. Pretty simple, right? It looks exactly like how anyone else would have ate crabs at the time. One important thing to note, though, is that there is no spice mix or seasoning used. Each ship was free to decide individually just how often they served crab and how specifically they would prepare it. For the USS Maryland, we actually used a combination of malt vinegar and mayo! It doesn’t taste too bad on an open-face sandwich, but I suspect the men wouldn’t mind the regular salt-pepper-butter combination either. Now, you’ll see that the Navy is also aware of the steamed crab. However, it wasn’t particularly clear to me whether this was more popular than the boiled crab or the deviled crab. Though, anything found in this book is pretty representative of what foods people are familiar with. After all, you would want your troops to feel as comfortable as possible. Familiar foods are comforting. It reminds people of home and why they’re out here fighting to begin with! Of course, a single crab won’t feed a Shaw, much less a fighting man of the U.S. Navy. Given the size of the navy pots (I’ll find pictures sometime!) you can bet that they made a lot of crab so each man can eat his fill. From looking at logs by submariners, it seems that the ocean was more plentiful at the time… or maybe the crabs were dumber and easier to catch. 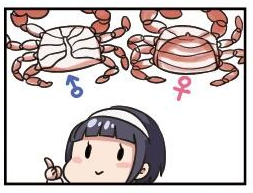 Either way, the Navy did leave out an important distinction: the male and female crabs. The navy most likely took what it got (which were probably male crabs) but with the free market you have much better choices. He-crabs look like that. She-crabs look like that. Pretty simple, right? Well, the taste is different! At least I can taste a difference. But the biggest bit is that She-crabs carry eggs (roe). While roe is considered a delicacy in East Asian cultures, it is actually a common ingredient found in soups and other rich dishes as well. She-crab soup, a crab-like bisque made from crab meat and crab roe (for that rich orange-ish color!) was a favorite of several of our Presidents and as famous as turtle soup. He-crabs tend to be bigger. In fact, they can get to much larger sizes than the females. As such, their meat also taste slightly different. Some people say it tastes better. I’m not inclined to disagree, but I like both! Now, the best part of the crab? Some will tell you it’s the parts where you pry the shell open. Let me tell you. It’s the claw. Trust me, the claw is the best part. Nothing tastes better than having a bunch of freshly steamed or boiled crab claws from freshly caught crabs. It’s great! MAAAAAAAAAAARY! HAAAAAAAALP! THE CRABS ARE REBELLING! IT’S IN MY HAIRRRRRRR AAAAAAAAAAAAAAA!! Sorry, dear reader. Looks like I’ll have to cut this one short. Hope to see you all soon next time!